Based on this week's schedule with Faith's birthday and Brownies, I knew we'd have to stay for martial arts class last night or risk not making it at all this week. 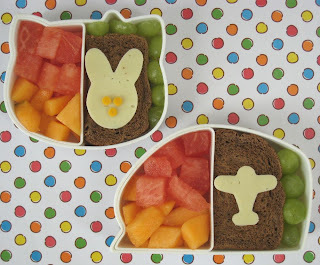 Since F&B are hungry after theirs, we need a healthy snack bento that wouldn't interfere too much with dinner. I kept it very simple, little decoration, just a single cheese cutout to spruce up the box. A little bit of cute, the kids love it, and it took all of an extra 15 seconds to get the extra cheese out of the fridge and cut it quickly with a cookie cutter. The kids have identical meals--ham and cheese sandwiches on fresh pumpernickel rye bread, watermelon from our garden, cantaloupe, grapes, and a simple white cheddar cutout decoration (bunny for Faith, airplane for Ben). I grabbed the bread from the bakery at Kroger and it is lovely. My grandpa used to buy pumpernickel from a bakery in Buffalo, I've always loved it! And if you haven't already, please check out this week's What for Lunch Wednesday for a Cause! As of publishing this post, it's up to 57 entries, which means 57 food items for the North Texas Food Bank! Faith's is Hello Kitty, Ben's is Shinkansen (also Sanrio, it's a bullet train).